You only had to look at the beaming smiles on the faces of the Iranian negotiating team to see who had emerged as the undisputed winners of the drawn-out negotiations over Iran’s nuclear programme. Iranians have long enjoyed a reputation for being wily negotiators, but the outcome of the marathon talks that concluded in Vienna amidst a fanfare of mutual congratulation will have surpassed even their wildest expectations. 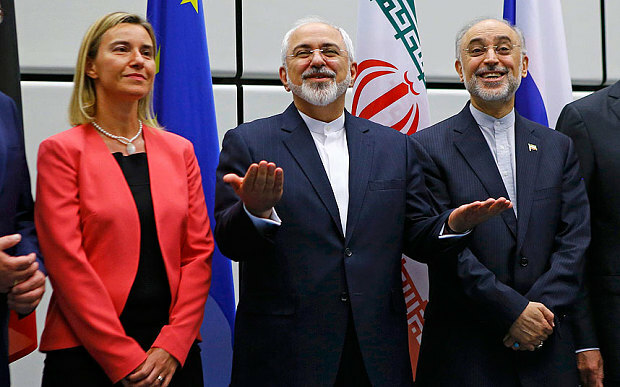 Tehran entered these talks, let us not forget, out of sheer desperation to escape the crippling effects of the economic sanctions imposed by the West in retaliation for Iran’s less-than-forthright disclosures about its nuclear activities. These included building a heavily fortified underground uranium enrichment facility at Natanz (whose existence was exposed by the Iranian opposition in 2003) and a similar establishment built deep within a mountain at Fordow (whose existence was exposed by British intelligence in 2009). Iran’s obsession with acquiring the ability to enrich uranium well beyond the level required for civilian and commercial applications, as well as its concurrent investment in building ballistic missiles capable of carrying nuclear warheads, has led Western intelligence to conclude – not unreasonably – that Tehran has been working on a clandestine atomic weapons programme. One of the main objectives of the Vienna talks, part of a diplomatic process that first began more than a decade ago, has been to get to the bottom of Tehran’s deliberate obfuscations. Western officials wanted to establish whether a country that is sitting on the world’s second largest oil reserves was seriously developing an indigenous nuclear power industry, or something far more sinister. Yet such is the Iranians’ negotiating skill that, despite years of intense diplomatic activity on the part of the P5+1 (the five permanent members of the UN Security Council and Germany), we are still no closer to understanding precisely what they have been up to. Attempts to force Iran to account for all the glaring inconsistencies that have arisen over the years in its declarations to the International Atomic Energy Agency have drawn a blank, with the Iranians claiming that the perfectly reasonable requests made by Western diplomats for clarification are insulting and disrespectful. The proper response by the White House to Iran’s refusal to cooperate should have been to keep the sanctions in place until the ayatollahs demonstrated a genuine desire to come clean. This was the attitude that prevailed in Washington during the presidency of Mahmoud Ahmadinejad, whose defiant attitude simply resulted in Tehran suffering further economic hardship. And yet, far from holding the Iranians to account for their deception, we now have the bizarre situation where we have world leaders from Washington to Tehran – even including Syrian dictator Bashar al-Assad – celebrating the conclusion of a deal which leaves us none the wiser about Iran’s true nuclear intentions. Moreover, the deal set out in Vienna yesterday allows Iran to retain vital capabilities that can be used for making nuclear weapons, such as developing more sophisticated methods of enriching uranium to weapons grade, as well as continuing development work on its ballistic missile programme. In return, Iran can now look forward to having the sanctions lifted as well as the global freeze on its assets, which could result in Tehran realising an estimated $150 billion (around £100 billion) in funds. No wonder the Iranian negotiators are celebrating their “historic” deal. The main reason we have ended up with this apology for a deal is that, rather than maintain the economic pressure on Iran until it guaranteed proper cooperation, President Barack Obama indicated he was more interested in securing his foreign policy legacy by signing a historic accord, irrespective of the concessions this would require. Mr Obama might have convinced himself that the deal cuts off all of Iran’s “pathways to nuclear weapons”, but that is certainly not how the deal will be viewed by those who have more intimate knowledge of the Iranian regime’s devious tactics, such as the Saudis and the Gulf states. Rather than being reassured that Tehran’s nuclear ambitions have been thwarted, they will view with alarm the prospect of a resurgent Iran, unfettered by economic constraints, seeking new opportunities to dominate its Gulf rivals. It is no doubt with this in mind that Prince Mohammed bin Nawwaf bin Abdulaziz al-Saud, the Saudi ambassador to London, warned in his recent interview with The Daily Telegraph that the Saudis might be prepared to acquire nuclear weapons of their own to defend themselves from further acts of Iranian aggression. If Mr Obama really believes his “historic” deal is going to bring peace to the region, then he needs to think again.